This story I want to tell you about happened in 1917. I worked at Mono Lake there. It was team days back then, and we was buildin’ highways. We had rippers pulled with horses to loosen up the dirt. We had about eight, ten teams on this ripper, made out of heavy iron like a plow. And then we worked with Fresnos getting the dirt out of there, and then we had horse blades. Everything was pick and shovel. Enjoy these authentic stories from Nevada’s past, told by the man who lived them. 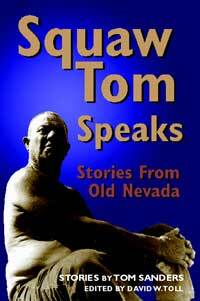 Tom was the real deal, and his unique tales illuminate a Nevada now nearly forgotten. They built a camp with a corral where a little stream of water come into Mono Lake there. Mono Lake had 23 minerals in there, heavy minerals. We lived in Army tents, with a out-house. .And they built a cook house out of tents; no floor, just a frame and planks sittin’ on sawhorses for tables. Wal, one day when I went to work Monday morning, there was a horse died on the job. And the boss decided that he wasn’t going to bury the horse. He’d just get a team and drag him out in the lake and let the water take him way down to the other end. So I drug the horse out, way out in the lake as far as I could drag him. Had a pair of stretchers and doubletrees, and I just drug him out and turned him loose. Well that horse drifted across that lake and we didn’t see him no more. Ten days later, we got a wind coming in from the other end. And by golly next morning, there was that dead horse back to camp again. The wind drifted him right back to camp. Man, did that horse stink! He was bloated, and he was full of maggots. And the boss, he had another bright idea. He borrowed a rowboat. And he got the powderman. And he got some dynamite. And then they went and got a chain and wrapped it around this horse’s feet. And this powderman rowed the boat way out there in the lake, rowing that horse out there. Well, the wind was coming back, and it began drifting the horse back to the rowboat. And the fuse was aspittin’, and agoin’. And man that powderman was rowin’ like hell. But he didn’t seem to make any time. And this Gibbs he was shoutin’ at the powderman: “Damn you, row! Row! Row! !” And the powderman was arowin’ like hell. Boy, he was really rowin’. But the boat wasn’t going anywhere, see, because when they dropped that chain it caught on some old snags down under the lake there. And the wind blew that horse right up to the boat where Gibbs was ashoutin’ and the powderman was arowin’. And Christ, that damn horse blowed up. And just as it went, them two guys jumped overboard. And when they popped their head up out of the water, the sky was full of horse guts. It fell all over them. Well, they was a bunch a these teamsters up on the bank, and they laughed and laughed and laughed. Why, it was a circus. Even the cook was outside watchin’ and laughin’ while them two guys swan to shore. And that Gibbs, he got so mad seein’ the men laughin’ at him that he fired us all. Oh man, he got insulted. Well, he was an Englishman, see. And nobody could laugh at him see. And that powderman, he said, “I quit.” He still had debris from that dead horse all over the top of him, and man did he stink. He jumped back into the lake again to get some of that crap off him. Well, we was fired. And we rolled up our beds and we camped on the hillside above the old camp. We’d been laughing so hard we didn’t have much strength left in us, so we bought food and camped there for two or three days. Washed our clothes and rested up. And at night we’ d build a big fire and all we could talk about was the horse debris falling down on that boss. He hired a new crew from Reno. And from then on that story circulated from one camp to another, construction camps and hobo camps, about the boss that blowed up dead horse all over himself. Even after all this time I have to laugh thinkin’ about that debris fallin’ out of the sky on them guys. Hittin’ that smart superintendent over the head. That was back in 1917, down at Mono Lake where we was buildin’ a road.